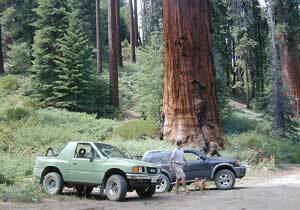 This impressive backcountry route is inside the newly formed Giant Sequoia National Monument. From the Western Divide Highway this graded route leads from an area North of the Trail of 100 Giants to the back edge of the Tule Indian Reservation. The 20 mile route turns north towards Coy Flat Campground (20 spots @ 5000′) & then meets up with Camp Nelson, California. The Summit National Recreation Trail cuts right thru this region & there are many dirt roads meandering off of the main route# 21S94.